Long before they re-formed the Iwatobi High School swim club, Haru and Makoto found themselves struggling to work with a very different team. As their middle school life begins, Haru and Makoto are each wondering what the future might hold, and what it means for them to truly grow up. But their process of sorting through these feelings is quickly put on hold by new responsibilities, as they're soon tasked with competing in a relay alongside two new faces: Asahi Shiina and Ikuya Kirishima. Between Asahi's loud bluster and Ikuya's cold indifference, it's hard to imagine these four could actually rise to compete together. But if they're going to become truly great swimmers, their journey must begin now, as they seek the strength and trust to succeed. As I discussed in my Take Your Marks review, the Free! franchise has undergone a variety of transformations across its timeline, and acquired a fair amount of both narrative and stylistic baggage along the way. The goofy comedy of the first season made for an odd lead-in to the somber reflection of Eternal Summer, while the franchise 's rotating series of directors have at times left it struggling to find a clear visual identity. Fortunately, those issues have only the most minor of impacts on Starting Days!, the one segment of the franchise directed by Kyoto Animation legend Yasuhiro Takemoto . Takemoto has been responsible for some of Kyoto Animation 's finest productions ( Hyou-ka , The Disappearance of Haruhi Suzumiya ), and in High Speed!, he blesses Free! with its most impressive installment yet. 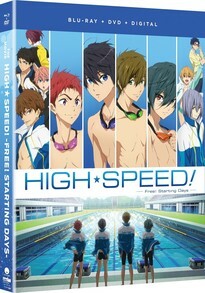 Though it only arrives two seasons into the anime franchise , High Speed! 's narrative actually predates both of them; this story is based on the original light novel that inspired the overall franchise . In part because of this, High Speed! 's story comes off as far more cohesive and self-contained than the franchise 's TV installments. We are introduced to Haru and Makoto right at the beginning of middle school, as each of them struggle with expectations both external and internal, along with the question of what it actually means to grow up. On top of this, they're soon strong-armed onto the Iwatobi Middle School swim team, where they find themselves partnered with two other first years: Asahi Shiina and Ikuya Kirishima. Each of them have their own misgivings about swimming, and over the course of the film, they clash and bicker and sulk, all their disagreements reflected in the fortunes of their relay. Unburdened by the need to either create a classically appealing sports lineup (the stoic one, the parental one, the glasses pusher, the chipper one), or to directly tie into a variety of related properties, High Speed! is able to gracefully play its various character journeys off each other. Total newcomer Ikuya in particular is a great addition to the story, with his unhappy relationship with his brother (who also happens to be the team captain) coming across as convincing and very sympathetic. Much of this film is dedicated to letting these characters simply stew and reflect on their feelings, conveying the frightening uncertainty of a major life change like entering a new school through their every glance and action. Additionally, the fact that we've jumped back to middle school makes Free! 's overarching emphasis on social insecurities and childhood friendships feel that much more convincing, as the characters aren't actually that far removed from those childhood memories. This tightly constructed narrative is tremendously elevated through Takemoto's gorgeous execution. High Speed! 's visual design embodies all the strengths that have made recent Kyoto Animation shows so special, from its beautiful, intricate backgrounds to its rich colors and careful use of post-processing effects. The color work deserves particular notice, with basically every scene being cast in rich, shifting hues that naturally echo the feelings of the characters. The fact that Free! has a less define color palette than most KyoAni works actually becomes something of an asset, allowing the film to dance gracefully between fading violet sunsets, burnt orange shadows, or the shimmering aquamarine of an outdoor pool. The film's animation is equally stellar, and does a phenomenal job of illustrating the subtle shifts in tone and posture that define its characters' evolving relationships. Divorced from the need to make self-contained, narratively cohesive episodes, High Speed! 's characters are given the space they need to truly express themselves, and sort through complex feelings at their own pace. The film frequently surrenders words entirely, and instead conveys some shifting of the characters' fortunes through beautiful montages set against the franchise 's strongest soundtrack yet. The combination of diverse, appealing orchestral melodies, emotionally resonant colors, and careful body language mean that like Liz and the Blue Bird , this is a film you could likely understand in an emotional sense even without an actual script. It's not all good news, unfortunately. High Speed! 's apparent need to somehow tether itself to the franchise proper means that like Take Your Marks, this film is peppered with appearances by supporting Free! characters who don't actually have any reason to be here. And while the appearance of people like Nagisa at least makes sense, the film's attempts to shoehorn Sousuke in end up distracting from its central narrative, and appending a Rin-focused conclusion that doesn't naturally follow from anything prior. Sousuke's material isn't even bad in its own right, but it serves as an awkward distraction in an otherwise cohesive narrative. Issues like that can't prevent this from easily being a franchise high point, though. Haru and Makoto's friendship has never been more convincing than this, and Ikuya works as an excellent counterpoint to Haru's feelings. All of our leads' personal dilemmas reflect off each other in compelling ways, and by the end, I was entirely sold on their ability to raise each other upwards to excellence. If not for the random Rin-Sousuke material, I'd recommend this film even to people who aren't familiar with Free! ; as is, I can at least say that it stands alongside Eternal Summer's peaks as the best of the franchise . High Speed! comes in a standard slipcase and bluray case, with no digital extras beyond the included dub . That dub is an altogether reasonable track, though both Asahi and Ikuya's characters come off somewhat differently from the Japanese takes. Christopher Ramirez (and the informal dub script) bring a dramatic energy and casual tone to the proceedings that will likely be somewhat divisive, while Ikuya's voice felt much too deep and mature for the part. On the whole, I'd say the sub is somewhat preferrable, but if you strongly prefer dubs, this one serves just fine. The last included extra is a “20 page art book,” which is essentially just a pamphlet with lots of stills from the film, along with character art of the leads in both middle and high school form. It's a somewhat limited release, but extras or no, High Speed! is an excellent film, and a terrific addition to the Free! canon. From its emotionally compelling and largely cohesive narrative to its gorgeous visuals and excellent soundtrack, High Speed! stands as a high water mark for Free! on the whole. If you have any love for the franchise , this movie is a must-see.